Two main voices, Cornelia and Clare, tell the story of this book from their refreshing perspectives in their respective chapters. I thought this was a nice touch and I really learned about them. Cornelia works in a cafe, enjoying the people around her yet she is also searching, knowing it will happen, for change in her life. She loves classic movies, well-dressed men, poetry, and shining moments. I loved her lively descriptions of scenes around her, just like the old movies she endears, and loyalty to her friends and family. Clare is eleven and under a lot of stress that should be unknown to her world but it isn't. Her life is complicated and she hides that fact as best as she is able in order to survive. To be honest, Clare tugged my heartstrings. As their two lives begin to unravel, they also eventually intertwine, so I jumped to conclusions pondering what would happen next then I found that my conclusions were wrong. I feel this added to the whole reading experience and a learning lesson of how quickly judgments are made sometimes. These two could be the only characters I cared about and it might be enough but they aren't and I wound up finding the whole cast memorable. Natural, warm-hearted, very flawed people that I may actually find in real life. This is one book I'm glad to have taken my time and not rushed through it. Enchanting, really. I loved this book so much, and time hasn't faded my opinion of it. I recently couldn't resist buying it at Borders while i was there, and I'm sure I'll reread it again soon. I'm so glad you like it Julie! 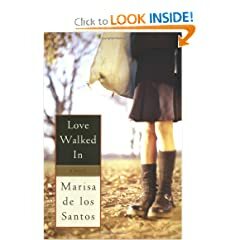 I think Marisa de los Santos is an underappreciated author. She can really write! Amanda ~ Thanks so much for introducing it to me. I've wanted to read it since the moment you reviewed it here. I really agree: "She can really write!" This one does look really good. Great review! Love your comparison to a black and white movie. Phantom Inkheart - Isn't that writing terrific? It just melts and flows so well even read aloud or silently. I wish to have put up more quotes from the book. It was hard to choose only three.